On 25 October, 29 men and women died in the Central Mediterranean Sea. 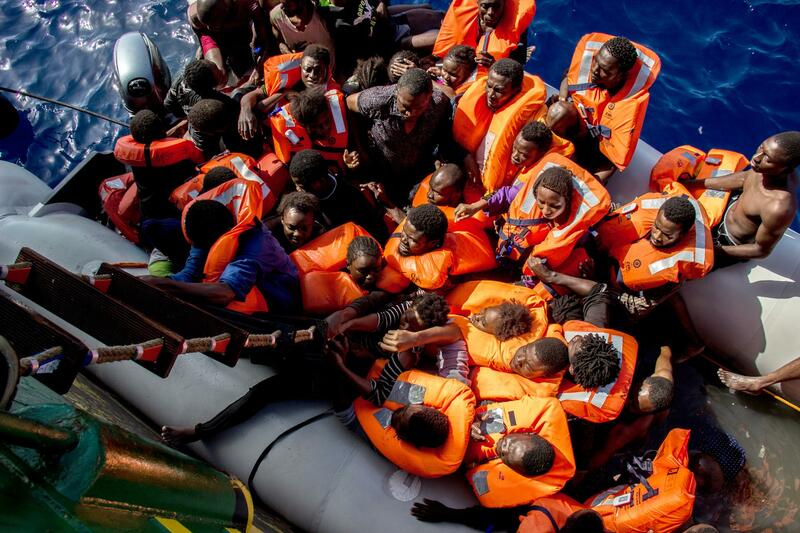 They were found by the Doctors Without Borders/Médecins Sans Frontières (MSF) search and rescue ship Bourbon Argos, in an overcrowded rubber boat some 26 nautical miles from the Libyan coastline. From one boat 107 survivors were rescued, with a further 139 from a nearby rubber raft, taking the MSF rescue total to 246 that day. “When we got to the first boat we brought the 107 survivors on board but couldn’t recover what we thought was up to 11 dead bodies, because we were called to another urgent rescue nearby,” recounts Michele Telaro, MSF’s Field Coordinator of the Bourbon Argos. “After rescuing those next 139 people we returned to discover that in the bottom of the boat, 29 victims of suspected fuel inhalation were hidden beneath a mixture of sea water and fuel. "Sea rescue operations are becoming a race through a maritime graveyard..."
"It took us three hours to retrieve 11 bodies because the mixture of petrol and water is so potent that we just couldn’t risk being in that boat for long periods of time. Medecins Sans Frontieres (MSF) field coordinator, Michele Telaro starts the distribution of lifejackets during the rescue operation in the Mediterranean Sea. As it was already dark and not wanting to delay the operation until sunrise, the MSF team called upon the assistance of NGO Sea Watch to recover the bodies still trapped in the rubber boat. Sea Watch transferred another body recovered from an unrelated incident to the Bourbon Argos's morgue and then recovered the 14 corpses. Among the rescued people, 23 were in need of medical treatment for chemical burns, 11 of them were classified as severe. Seven patients required a medical evacuation and two were so severely injured that they were taken by helicopter for emergency treatment in Italy. The life of one young woman was saved by the medical team on board who intubated and stabilised her prior to evacuation. The survivors, among them the husband and the eight month old child of one of the victims, were given immediate psychological aid by the MSF team and will be given further support and care by MSF’s psychological first aid team on shore once they disembark in Italy. Medecins Sans Frontieres (MSF) field coordinator, Michele Telaro together with two members of the Bourbon Argos crew, distribute lifejackets during the rescue operation in the Mediterranean Sea. “This is a tragedy, but we can’t say that today is an exceptional day at sea," said Stefano Argenziano, Manager of Migration Operations for MSF. "The past weeks have been horrific with our rescue teams and other boats involved in almost continuous rescues and far too many men, women and children dying. Sea rescue operations are becoming a race through a maritime graveyard and our rescue teams are overwhelmed by a policy-made crisis where we feel powerless to stop the loss of life. “2016 is expected to be soon declared the deadliest year on record in the Central Mediterranean Sea. In 2016, 327,800 people have arrived in Europe by boat this year and 3,740 lives have been lost to sea according to UNHCR. With two months left to go, 2016 is fast-becoming the deadliest year on the Mediterranean. MSF has teams on board three boats in the Central Mediterranean Sea and has rescued over 17,000 people since the beginning of operations in April this year. In the face of this tragedy MSF again reiterates that whilst search and rescue is lifesaving, providing safe and legal routes is the only way to end deaths at sea.